Submitted by HS on Tue, 2009-03-31 11:06. 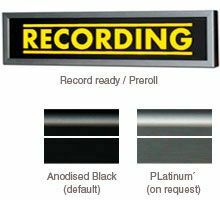 The RECORDING Display is a light unit which has to be connected to the PunchLight GPI, PunchLight DLi or the PunchLight MIDI either of which act as a trigger. It is designed for studios where aesthetics are important. In the standard version the product displays "RECORDING" in red and also has lights for "Record Ready". It comes in a very smart brushed aluminium casing. 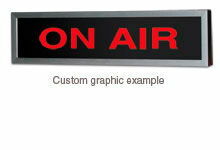 Custom labels, text or graphic can also be specified upon request. (w x h x d) 11.8" x 3.3" x 0.97"
Submitted by HS on Tue, 2009-03-31 11:07.